Boltonia asteroides (L. ) L'Her. 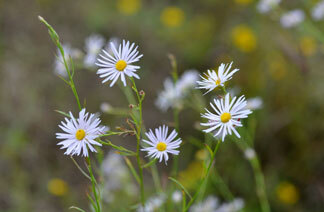 Also Called: White doll's daisy, false aster. Stems: Erect, glabrous, longitudinally ridged, much branched above; branches spreading to ascending. Leaves: Alternate, simple, mostly sessile, narrowly elliptic to lanceolate or linear, 4/5 to 6 inches long, 1/5 to 4/5 inch wide, progressively reduced above, glabrous; margins entire, slightly rough; tips pointed or long-tapering; lower leaves gone by flowering. Inflorescences: Heads, several to many, 3/5 to 1.25 inches across, terminating branches; stalks 1/5 to 8.8 inches long; involucre hemispheric, 1/8 to 1/4 inch long; involucral bracts 0-15, overlapping in 3-5 series, narrow, spatulate to oblanceolate, 1/12 to 1/2 inch long; midribs dark; tips pointed or broadly spatulate with abrupt short-points; ray florets 20-60, .4 to .7 inch long, white to pale lilac or pink; disk florets 60-180, corollas yellow. Fruits: Achene, wedge-shaped to egg-shaped, 1/12 to 1/10 inch long, flattened, tan to grayish-brown, surface often minutely hairy, wing-margined, tipped with 2-4 well-developed awns and a few minute bristles, enclosing small seed. Habitat: Stream banks, margins of ponds and lakes, bottomland prairies, ditches, fallow fields, edges of crop fields, sandy disturbed areas; open damp or wet sites. Comments: Boltonia is sometimes planted as an ornamental. It is named after English botanist James Bolton, 1758-1799. Boltonia resembles our asters, but the pappus of its achenes differs. The pappus of Symphotrichum has many long, hair-like bristles.